What’s really happening in hospitals related to electronification of payments? Have other topics become a priority? Are there “hidden” problems in infrastructure which are adding excessive costs to the healthcare industry? Along with Commonwealth Health Advisors, OrboGraph completed a market research initiative which surveyed over 100 US hospitals. 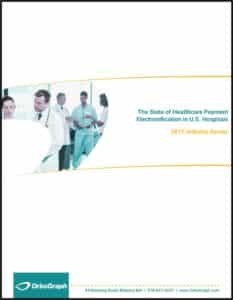 The objective of the research was to benchmark the electronic and manual business practices related to healthcare payments within these organizations. For example, were insurance payments mainly electronic (using EDI 835 files) or paper-originated (via EOB, explanation of benefits forms)? Only 66.8% electronification was achieved via the payment process overall from the survey results. Larger hospital systems were the most successful, but there is significant room for improvement. Nearly 50% of the hospitals are unhappy with how they are processing Correspondence letters. Less than 17% of the hospitals are fully implemented with an electronic reconciliation of EFT/ACH to 835/ERA . Nearly 30% of the market is unsatisfied with how their processes are managing the remaining paper remittances. Overall, it’s clear that the road to significant cost savings and operational improvements is paved with 100% electronification. Significant progress still needs to be made, however, to achieve efficiencies and cost-savings in EOB and correspondence letter processing. Click below to read The State of Healthcare Payment Electronification in U.S. Hospitals and see if any of our data surprise you.